I love making lists. Every Sunday I make a list for the week. I write out what we have going on each day like work, school, appointments, deadlines, things I want to accomplish each day, etc. Along the bottom I make a list of other things I would like to (need to) get done that week, like calls to make, things to get scheduled, and house projects. Finally, down the right side of the page I keep a running list of things I need to buy at the market that week. I live by this list and am constantly updating it - I can't remember anything without a list! So whenever I go to the supermarket I always have a list and put it in order of the aisles (are you starting to think I might have a Type A personality??). If my husband asks me to get something as I'm walking out the door, chances are that I'll forget unless I grab a pen from my purse and scribble it on the list. But just because I have a list doesn't mean I only buy what's on it. When the little one is with me we'll often pick up an extra snack or sweet treat. Or if I see something interesting or inspiring I'll throw it in my cart. That's how these egg rolls came to be. I was looking for kale and they were out (ugh - hate that!!). But right next to the empty shelves I saw a bag of what they called "ribbon salad." It was cabbage, broccoli, and cauliflower all cut into short and thin ribbons. 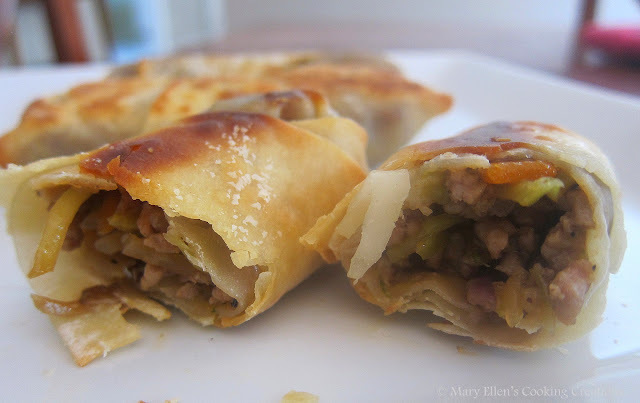 I immediately thought of egg rolls and grabbed a package of egg roll wrappers and ground pork (2 more things not on my list!!). 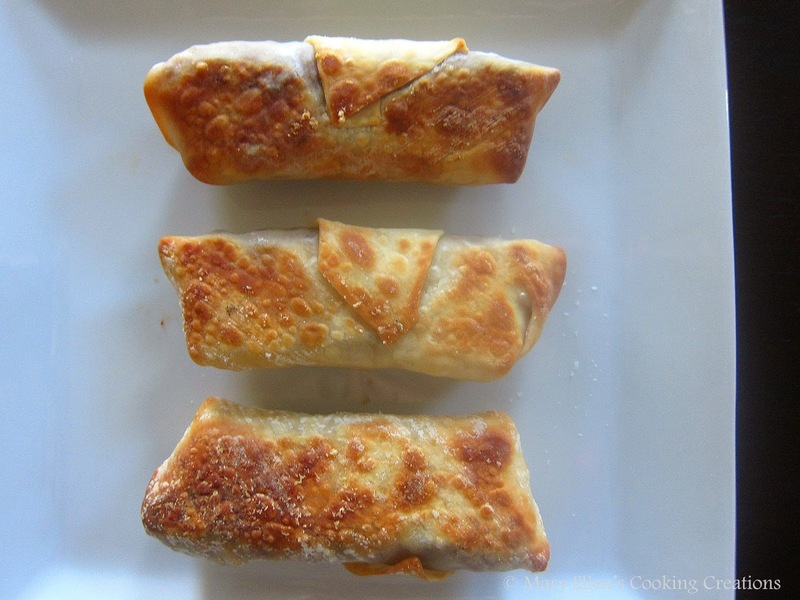 I made egg rolls once before but didn't follow a recipe so I did not include a sauce in the mixture, and they came out a little dry. This time I did some research and adapted a recipe I found on Taste of Home. I followed the ingredients for the sauce, changed up the protein to ground pork and veggie ingredients, and following the baking method. These were awesome! Baking made them crispy but not greasy like the ones you get in a Chinese restaurant. The filling was perfectly moist, savory, and the veggies still had a bit of crunch to them. Another plus - they are fun and easy to make. My almost 4 year old had so much fun rolling them and then watching them bake. Heat olive oil in a large sauté pan over medium high heat. Add the pork and cook, breaking it into tiny pieces with the end of a spatula or wooden spoon, until almost cooked through (about 3-4 minutes). Add the onion, ribbon salad (veggies), and garlic. Saute 3 minutes. 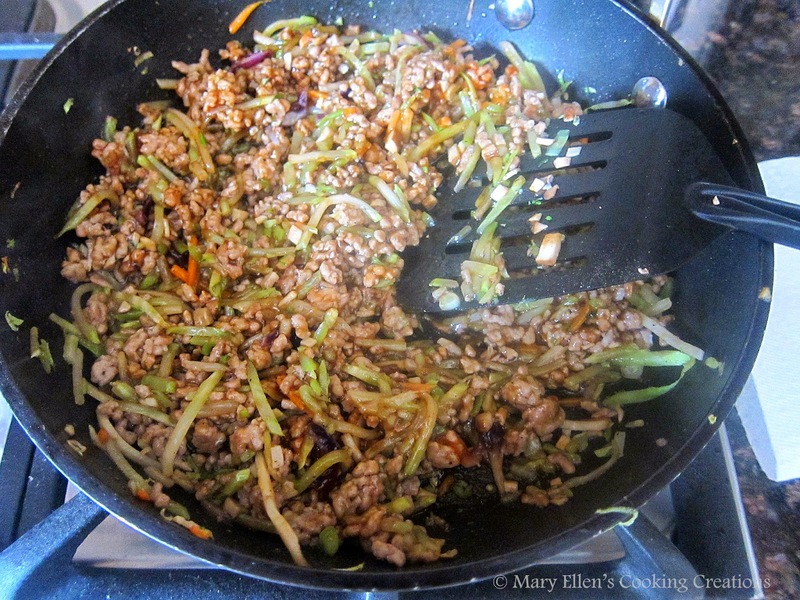 In a small bowl, mix the cornstarch, water, soy sauce, vegetable oil, brown sugar, and Sriracha. Add the sauce mixture to the pan and bring to a boil. Lower heat and let simmer for 2 minutes. Taste and adjust soy, brown sugar, or Sriracha to your liking. Roll the rolls - Spray a baking sheet with cooking spray. Lay a wrapper flat on the sheet (like a diamond - pointed end facing you) and spoon about 1.5 Tbsp of the mixture onto the bottom third of the wrapper. Fold the bottom of the wrapper over the mixture and fold in the sides. 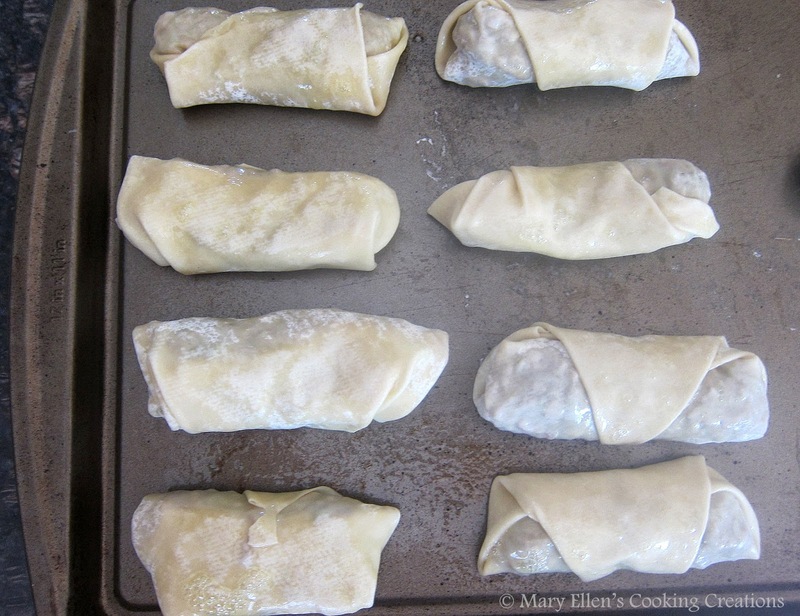 Roll it once and fold in the sides again. Roll it until sealed (about 1.5 more turns) and place seam side down for baking. 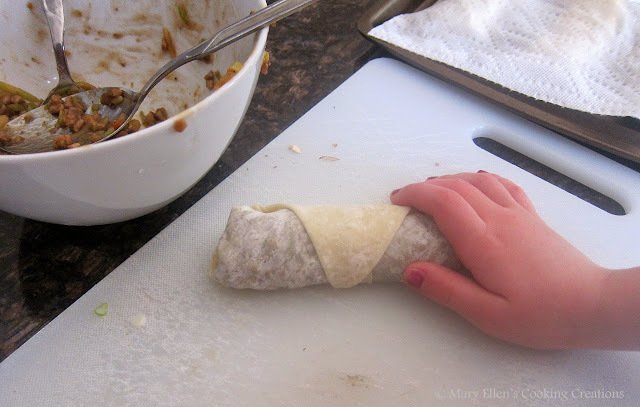 Continue rolling all of the rolls until done and then spray them with cooking spray. Bake for 10-15 minutes or until golden brown, flipping them over a little more than halfway through cooking. Yum! I love me some eggrolls, and have yet to attempt them.